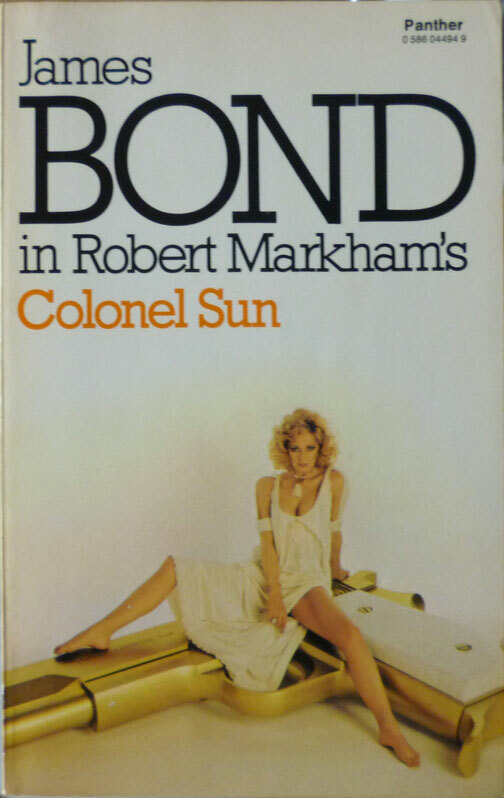 This 'ere is the 1977 UK Triad/Panther paperback edition of Robert Markham's Colonel Sun, which was the first James Bond novel to be written by someone other than Ian Fleming after Fleming's death in 1964. Penned by Bond fan Kingsley Amis under a pseudonym that was intended by Fleming's literary estate to be a kind of hand-me-down moniker for any authors who wished to pick up the Bond baton – but was, in the end, only ever used for this book – it was originally published in 1968 by Jonathan Cape – which is the other edition I already own. 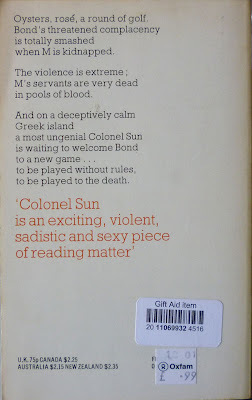 But when I saw this '77 first print paperback on the shelf at the Lewes branch of Oxfam recently, for, as you can see by the price sticker on the back, 99p, I couldn't resist it. 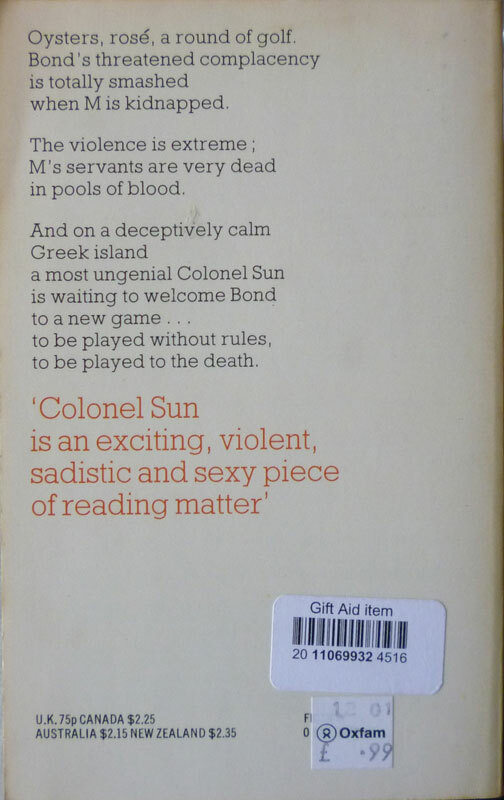 Colonel Sun went through three UK paperback publishers following its 1968 hardback debut: there was a Pan edition in 1970 (some say 1968, but I'm unsure about that); this Panther paperback in '77; and finally a Coronet edition in 1991. All of those went through multiple printings under different covers (two covers in the case of Coronet, I think), but the novel is currently out of print. Which is a shame because, although in Bond fan circles I know it's not terribly well-regarded, I actually thought it was a decent read. It's not up there with, say, Casino Royale (1953), or From Russia, with Love (1957), but it's probably the equal of Diamonds Are Forever (1956), which I slightly struggled with due to its rather too relaxed American travelogue plot (one too many chicken dinners for Bond there, I felt). Colonel Sun suffers from a similar problem once Bond decamps to the Greek islands on the trail of the nefarious eponymous Chinese colonel, where it becomes slightly directionless. But Amis's characterization of 007 is solid, the novel gets off to a cracking start with the kidnapping of M and a couple of affecting deaths, and there's an obligatory but effective torture sequence towards the end, a bit of business of which Fleming would surely have approved. 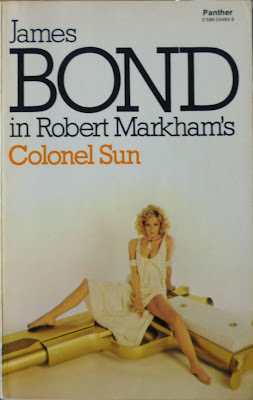 I covered the Panther editions of the Bond novels, with their golden gun Beverley le Barrow covers, extensively in this post and this post, and reiterated what I've learned about Beverley himself in this post last week. But now I have this copy of Colonel Sun in hand, I can confirm a couple of other details from the photo session credits on the inside front cover. The dress the lovely legs-akimbo lady is wearing is by Jean Varon (misspelled as "Varron" in the cover credit), which means it was probably created by Youthquake designer John Bates. The model's hair, meanwhile, was styled by Schumi, so that's likely Chelsea hairdresser Gregor Schumi. So now you know, and now I can add the back cover to that Bond Triad/Panther cover gallery I linked to earlier. Right then. What have we got to round off the first week of Spy Fiction Fortnight? How about a little-seen 1957 first edition of a collection of excerpts from sundry espionage stories, compiled by Graham Greene and his brother, Hugh...?